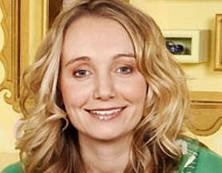 I wrote some time ago about Cerrie Burnell, a BBC children’s TV host whose disability has riled some parents in Britain. We like Cerrie Burnell’s motto: “I don’t Care If You Are Offended” and we know the cost of that motto. Every day as I walk with my guide dog I am stared at. Every time a wheelchair user navigates a public space “the stare” is a ophto-centric psycho-social version of legal tender—one is tacitly accepted or there’s a moue of disgust, discomfort, or pity. This “giveaway” facial tic can’t be disguised. And yes, though I’m visually impaired I “know” the look—know when it occurs. We are accordingly huge fans of Ms. Burnell who is helping to make physical difference a commonplace thing for the next generation. LONDON, ENGLAND– [Excerpt] Just recently, Cerrie Burnell’s mother reminded her of the daily fights they had when Burnell was a child. Every morning before school, there was a struggle, lasting up to two hours, to get her to wear a prosthetic arm. Her doctors had told her parents that it would make their daughter’s life easier: it would help with her balance, she would be able to use a knife and fork and, I suspect, fit in better with the other children at school. But to Burnell, it was this "heavy, uncomfortable, ugly, pointless . . . thing" that had become her disability, not the fact that she had been born with her lower right arm missing. "Take it off me and I can do anything; put it on and it was like a burden, clipped wings," she says. "It stopped me running, jumping. My friends thought it was stupid as well. My parents weren’t comfortable with making me wear it but I think they felt they had to. I don’t remember this but my mum told me the other week that I used to say to her, ‘I’m more beautiful without it.’"
At the age of nine, she announced she would never wear a prosthetic arm again, and she hasn’t — not when her tutors at drama school suggested she wear one to help her career prospects, and certainly not when shortly after she landed her job as a presenter on CBeebies, the BBC’s children’s channel, in January 2009, a flurry of demented emails and posts on a BBC messageboard objected to her presence on television. One parent wrote that her appearance "freaked out" their child, another that the broadcaster was just filling minority quotas, as if this one aspect of her body defined her, whereas in fact it would be hard to find a children’s TV presenter more perfect than 30-year-old Burnell — she can sing and dance, she is beautiful, with a wide, open childlike face, and she radiates a rare goodness.